Download Hour1 Download Hour2 What to do amidst a vast apparatus designed, as Graeber wrote in episode 624, to "perpetuate hopelessness"? Chris Hedges recommends a path of courageous and unflinching non-violent resistance to the US plutocrats. We hear a 90 minute interview from earlier this week, interspersed with half of a classic Hedges speech, "War Is A Force That Gives Us Meaning". After quitting as a war reporter, Chris Hedges wrote a powerful series of books. These season his insights as a war correspondent with parallels ranging from ancient Greek literature to contemporary USA. An active supporter of Occupy, he is still engaged in legal action with the US government about the unconstitutionality of NDAA. This week, we dedicate the show to Chris Hedges. We begin with the first part of a 6 part discussion that was published earlier this week by The Real News Network, in which Hedges tells his life story and sets the scene for the rest of the show. Next we hear the second half of a classic Chris Hedges speech, "War Is A Force That Gives Us Meaning", made on 2003-10-11, from Active Ingredients. This powerful speech is an extended version of the speech to Rockford College which lead to his resignation from the New York Times. We the continue with the remaining parts of the news from the "Reality Asserts Itself", very slight cut to remove hesitations. A post-occupy, post-Snowden Hedges continues to recommend mass non-violent resistance to the totalitarian fascism that is being rolled out by the corporate elite. I think [the ruling elite] are very fragile. I think internally they know how corrupt they are, which is why they passed the NDAA because they want to be able to pull the military on the streets because I think ultimately they don't trust the police to protect them. And those are the sentiments of a dying elite - so I think when we begin to organize against all the formal structures of power, I think that they may crumble as the Stasi state in East Germany which when I was in East Germany appeared monolithic. It fell in about a week. 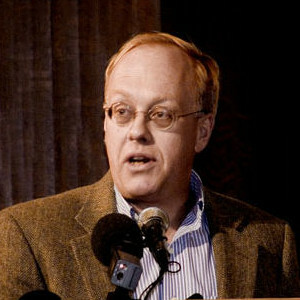 Thanks to The Real News Network for the Chris Hedges interview, and thanks to Active Ingredients for his 2003 speech. This episode rebroadcasts content from 227. This page was last modified on 12 January 2014, at 05:22.